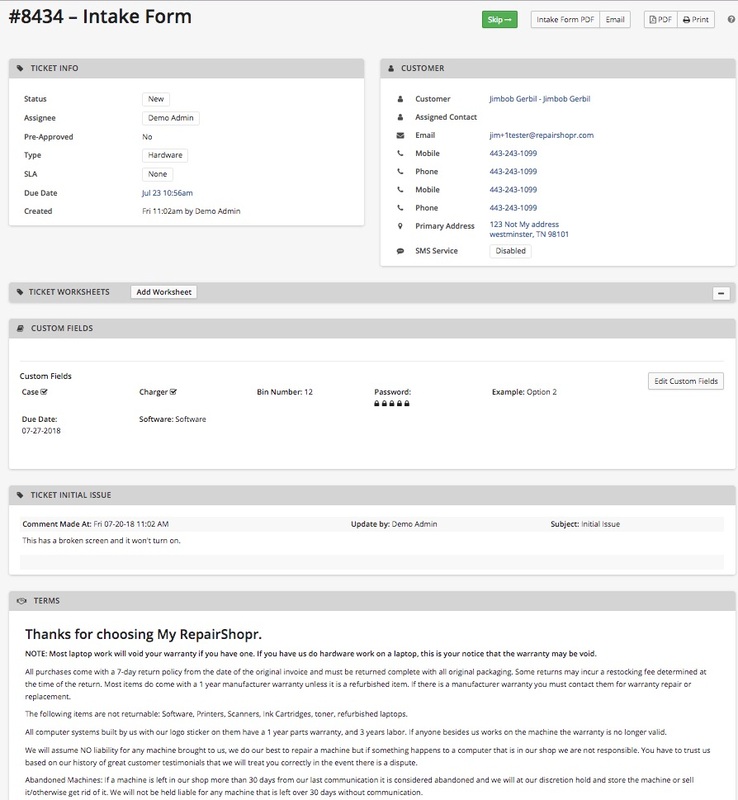 The ticketing system is one of the core features in RepairShopr. In this article, you can find the answers to most questions regarding the ticket system. Use the table of contents below to jump to the information you need. How do I modify and adjust tickets that have been created? Add/View Charges - How do I add charges to a ticket? How do I order Parts on a ticket? Ticket Timer - How do I keep track of time on the job? How do I create Tickets via inbound email? There are many ways to create a ticket, the quickest way is to click on the big green button that says "New Ticket"
on your home page. It will look like this. You can also get the option to add a new ticket from the "+" at the top right and the tickets tab. Clicking on that button will take you to a page where you can add the customer. If the customer is already in your database options will begin to appear. If the customer does not exist the system will direct you to a page where you can add the customer. You also have the option to create a custom workflow at the top right. To stick with the standard workflow select 'Original Ticket Workflow". Click on the drop-down that says "Choose Workflow" to view your options. Ticket Title (Short Description): This will be visible on the tickets tab, try to put something here that will help you recognize the ticket at a glance. Issue Type: Add the type of work for the ticket i.e. Remote Support, Hardware, Virus etc. Complete Issue Description (This is emailed): This will be emailed to the customer to confirm a ticket was made and what the ticket is for. Tech: Assign an employee to a ticket using the drop-down here. Assigned Customer Contact: Use this to create a ticket under a point of contact's name, instead of the main customer on the account. You can learn more about how contacts work here. Ticket Appointments: Click this button to create an appointment. It will reveal options that look like this. 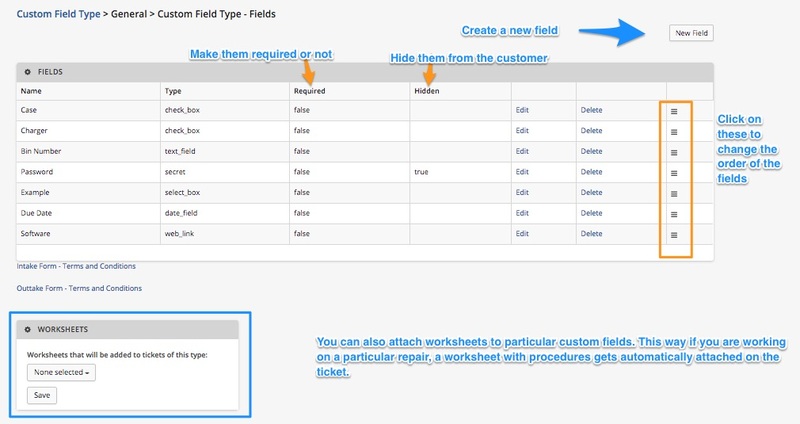 Ticket Custom Fields: If there is additional data that needs to be captured, you can create ticket custom fields and select the custom field type in the drop-down. 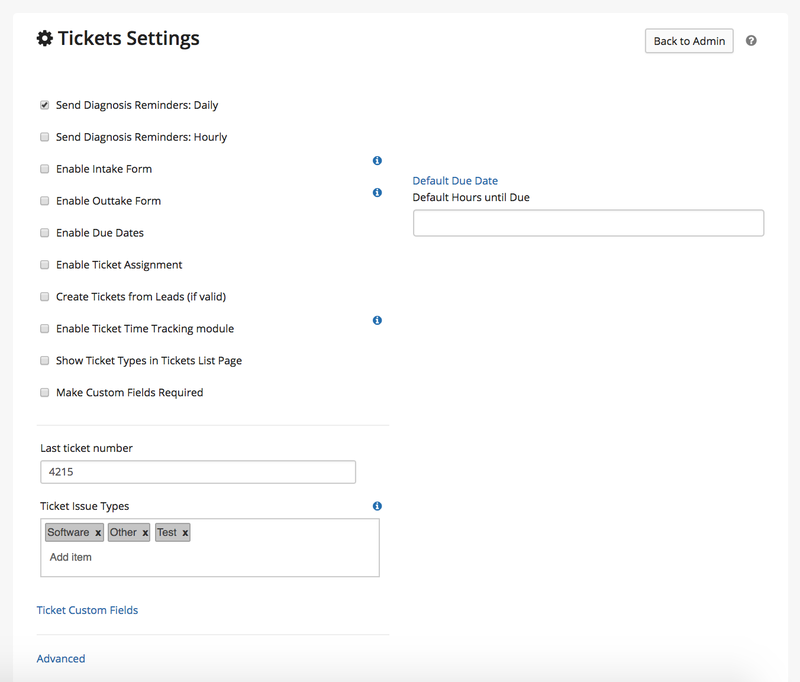 You can learn more about ticket custom fields here. Assets: Click this button to attach a customer asset to the ticket. You can learn more about assets here. You can add an existing asset from the drop-down or create a new one. Once you click on the green button to create a ticket, you will either be taken to the ticket or an intake form. Once the customer signs your intake form you will be re-directed to the ticket page. Status, Priority, Assignee, Type, and SLA - These can be clicked to modify inside the ticket. Additional CC's - Enter emails addresses here to be copied on Email communication on this ticket. There is also a autocomplete to help enter emails quickly. There are many ways to enhance and customize RepairShopr to fit your needs. This versatility means that there are going to be a lot of options for you to enable or disable depending on what works best for your workflow. This article will break down each setting so that you have a better understanding of the plethora of options available to you. Send Diagnosis Reminders Daily / Hourly: Triggers Diagnostic email reminders at either interval. Require Intake Form with Ticket: Customers must sign your Intake Form, containing your Terms and Conditions before moving forward with the Ticket Creation. Tickets do not email initial problem by default: Customers are not notified of the initial recorded issue during the Ticket's creation. Enable Due Dates: Allows you to set due dates for Tickets, that will trigger notifications as needed. 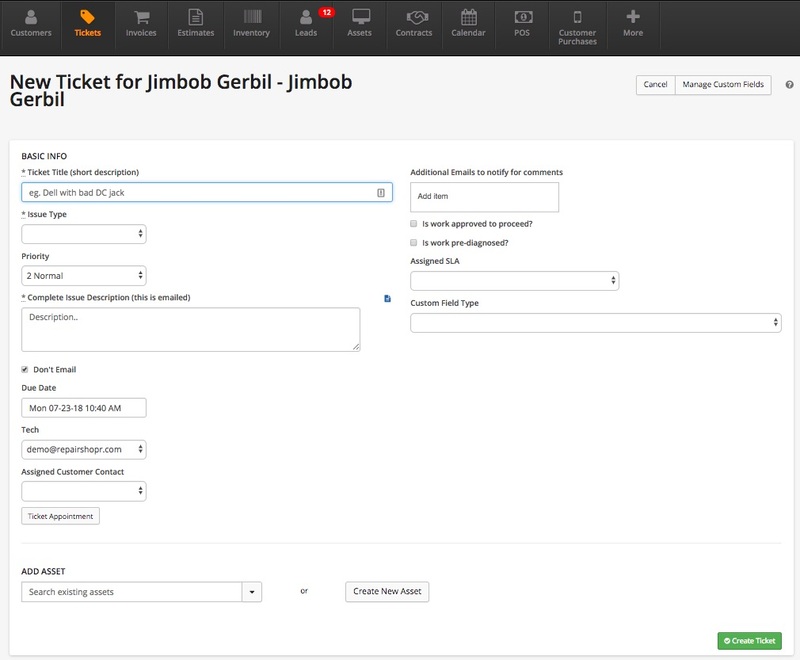 Enable Ticket Assignment: Allows you to assign Tickets to specific Techs. Create Tickets from Leads (if valid): When a valid Lead is captured, you have the option to convert it to a Customer + Ticket. Enable Ticket Time Tracking module: Allows you to track how much time is spent on any given ticket by revealing the Ticket Time Tracking module. Also integrates with Toggl. Enable Recurring Tickets: Allows you to schedule recurring dates for Tickets. For more information, review this article. Hide Ticket Status in Customer Portal: Customers will not be able to see the status of their Tickets when they're logged into the Customer Portal. Tickets do not email initial issue by default: Customers are not notified of the initial recorded issue during the Ticket's creation. Ticket comments - do no email comments by default: Enabling this will make do not email the default when submitting a public comment. Ticket comments - default to internal instead of external: This will make it so the "Internal" option on comments is the default. Tickets - Send Ticket Autoresponder for emailed in tickets: When someone emails a ticket, an autoresponder message will be sent. Use Due dates in Ticket Dashboard: The ticket dashboard will use the due dates specified on the ticket. You can learn more about the Ticket Dashboard here. Require Time entries for ticket comments: This requires your users to add "minutes spent" when they make a comment to a ticket. Prevent Customers from Creating new Tickets in Customer Portal: Customers cannot create tickets in their portal, they can only view the status of tickets. Disable ticket progress widget: This removes the progress bar at the top. Attach Ticket PDF to all Ticket Comment Emails: Enabling this will send a "Large Ticket" pdf with every comment email. Disable prompt for Open Invoices on Tickets: Turn off the warning that a open invoice is attached to the ticket you are making a invoice from. Subject to Ticket Comment Emails: This is the subject your Customers will see when you submit a new Ticket Comment. Private Staff Email: This is where you'll receive alerts from your account. Inbound Email Alias: This allows you to use your own email instead of the default email in the application. Tech Reminder Email: Certain reminder triggers will go here to alert all of your Technicians. Ticket problem types: Create a list of all your commonly encountered problem types. Separate with commas, and use no spacing. 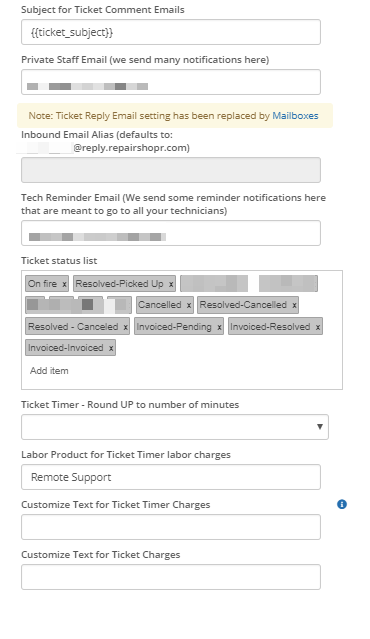 Labor Product for Ticket Timer Labor Charges: Using the Time Tracker Module from a Ticket (See Above), you can track time spend on a ticket, and add this time as a Labor charge to that same ticket when the work is complete. Click here for more information on how to use the ticket timer. Fill in the Labor item you'd like to use for Ticket Timer Labor Charges in Ticket Settings. Start tracking time on a Ticket. When you're finished, stop tracking Time. Customize Text for Ticket Timer Charges: Insert Ticket or Customer tag here to have them default to the description for all ticket timer charges! We added some specific tags for this field that can be used as well! Ticket-Custom Fields: Please refer to our existing article on this topic. Create new Ticket if Customer replies to an old Ticket that was resolved more than X days ago: Prevent a old ticket from getting re-opened by a customer by setting the amount days after it's been resolved a ticket could be re-opened. In the ticket tab you can create filters or group ticket types to make finding tickets much easier. You can also save searches so that you can simply get back to a search with a click of a button. It is possible to choose from a variety of categories of data to have displayed on the Tickets Tab by clicking the Customize button. A pop up will appear showing all of the categories. There are quite a few to choose from. You can even select from Custom Fields! NOTE: We don't restrict the number of active columns. Choose to many and the column width may adjust to be to small. Grouping Tickets allows you to group tickets by attributes so that they are more organized and easier to distinguish on a page. You can create search filters and save them so that you can easily get to a particular search at any time. For example, maybe you only want to look at the tickets for a particular technician, creating a search filter will make it easy for you to refer back to this technician's tickets at any time. When creating a news Search, you can choose to Sort the columns so that the next due ticket is at the top of the list for instance! To set these up, head to Admin > Tickets > Ticket-Custom Fields, or "Manage Custom Fields" when you create a new ticket. Once there, you can click the New Custom Field Type to get started. After doing so, you'll be prompted to name your new Custom field type. Note that this name is what will "hold" the actual fields themselves. We recommend large context names, like "New Computer Check In, New Phone Check In, Computer Clean Up" etc. 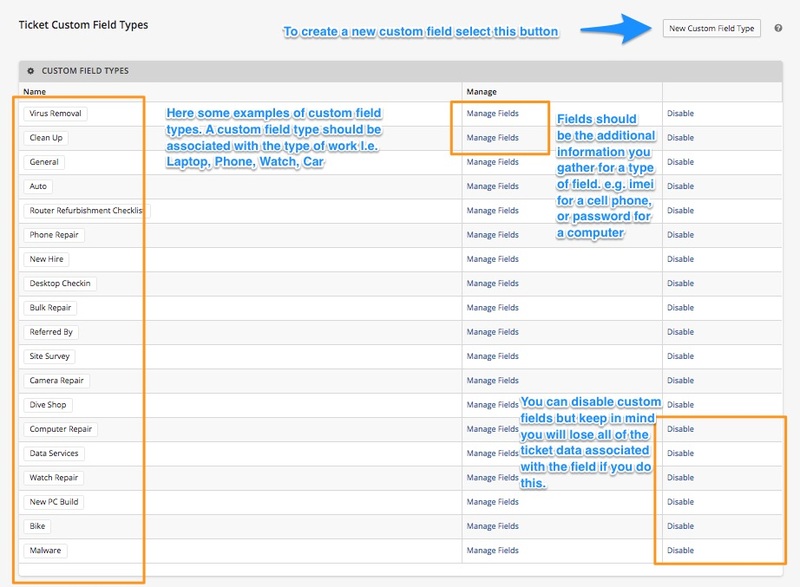 After creating your custom field type, click Manage Fields. You can many types of fields. i.e. 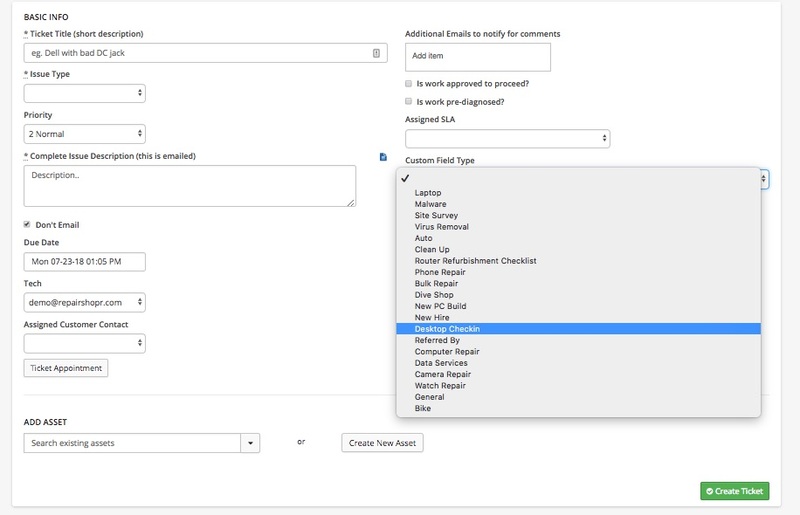 drop-downs, text field, checkbox, date field and much more. Popup: Will create a pop-up when someone visits the Ticket Detail page. Scribble: This field allows you to draw things and have it attached to the Ticket. This is great for pattern unlocks for instance! As mentioned, you can add multiple custom fields to a custom field name. So in this example, "New Computer Check in", I can create multiple fields, like a text field for "Password" and a drop down for "Operating System." If I mark both as required, technicians will need to fill these out before the ticket can be created. If you name two fields the same name, your data won't save properly and may cause errors when trying to save data. Deleting a Ticket is super easy, but remember...With great power comes great responsibility! Navigate to the ticket you wish to delete. 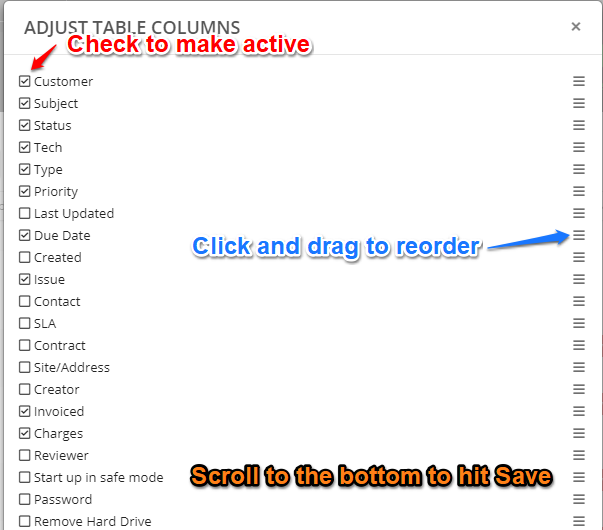 Next click on the Actions button and at the bottom of the drop down, you will find a 'Delete" button. Click the Deleted Tickets link and the next screen will show you a list of the tickets that have been deleted. You can click the green 'Restore' button to restore the ticket. Ticket Charges are line items that are added to tickets to prep them for invoicing once the job is done. You can add existing inventory products like labor items to a ticket as well as manually-added line items such as parts. The Ticket Timer feature also uses the Ticket Charges to track how much work is done for a customer. You can get to the "Ticket Charges" screen by clicking on the "Add/View Charges $0.00" button at the top of a ticket. When ticket charges are added, this number will be updated to display the charges on the ticket. The Add New Item section will allow you to add inventory products or manual line items to the ticket. You can add inventory products by typing the product name in the "Name" field and selecting the product as it pops up below. Click on the "Make Invoice" button to convert the charges to an invoice. If an invoice is opened directly from the ticket with the pending charges, then the charges will automatically be added to the invoice and will not be displayed in the Shopping Cart. If the ticket has a UNPAID invoice associated to it and someone clicks the Make Invoice button, you will be prompted asking if you want to continue making a new invoice or proceed to the existing invoice. This function is on by default and can be disabled if you desire in the Ticket Preferences. See Ticket Settings for more info. Alternatively, you can add the charges via a shopping cart on the invoice. This is really useful when you are working on multiple tickets with several charges on each one. If a customer has an open ticket with charges and an invoice is opened, the pending ticket charges will show up in the "Shopping Cart" pictured below. In the Shopping Cart you can see the total price for the line item charge, the ticket it is on, the name of the line item charge, and the status of the ticket. You also have the option to add individual line item charges from tickets or add them all in one go using the "+Add All" selection at the top. Part Orders that follow some criteria can have the part automatically added as a Ticket Charge to a ticket. First make sure in the Part Order that it is linked to the correct ticket, there is a quantity entered, a retail cost for the customer, and optionally it can be marked taxable as well. You must fill out these fields before the part will be added as a Ticket Charge. Once the Part Order has a date set for "Received:", it will be marked as resolved and the part will be added to the ticket as displayed above. This is done by using the Ticket Timer on tickets, either by manually entering the time as it was tracked, or by pressing the start/stop buttons on the timer itself. This is also the place where you can add notes about what was done to track what kind of work was performed. Once all of the time is in the Timer Log, you can click "Charge Time" to bring the charges over to the Ticket Charges area. We can do this as many times as we want, and it will gather all of the charges together to be billed. 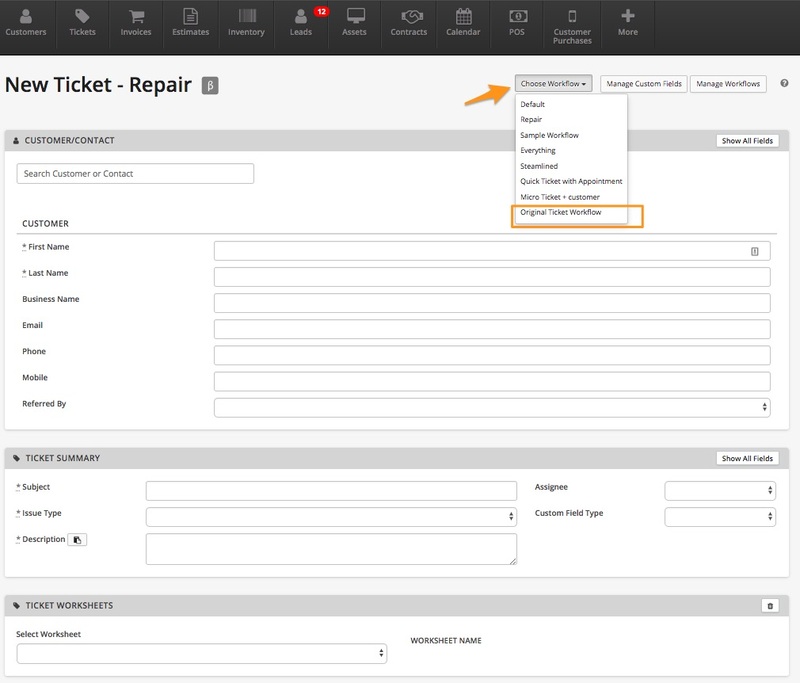 Make an invoice from the ticket and all of the charges will automatically be brought over and added to the invoice. You can then add additional items, or just bill the customer the charges. 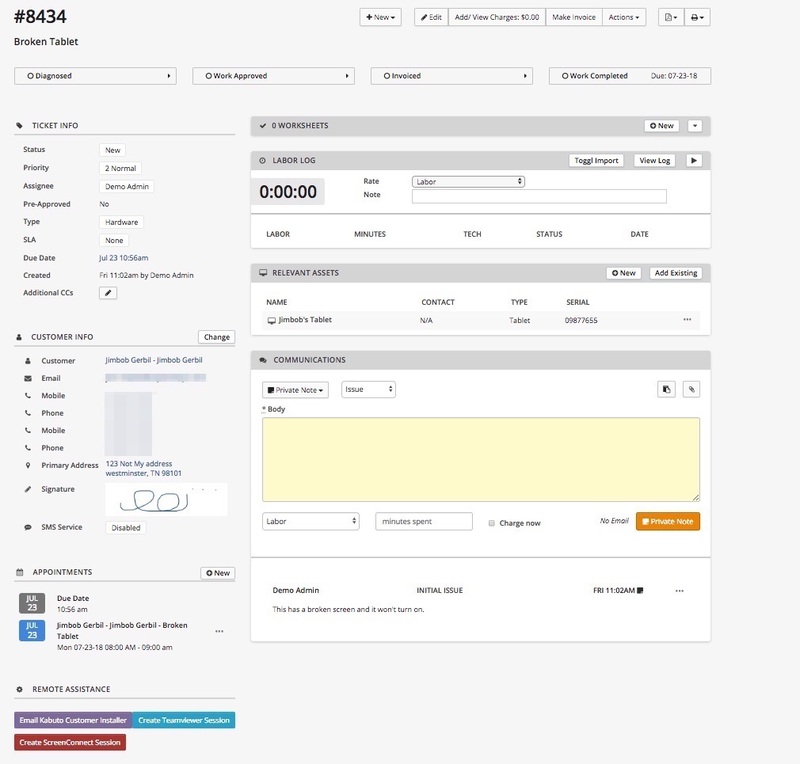 - If an invoice is created from a ticket with charges, the charges will be brought over to the invoice automatically. - If the line items are deleted from the invoice, the charges will return back to the ticket. - If the invoice is deleted, the charges will return back to the ticket. - If an invoice is created for a customer who has pending ticket charges, those charges will show up in the "Shopping Cart" area of the invoice instead of being automatically added to the invoice.